REFLEX CES offers the possibility to buy the A10 SoC SoM separately. 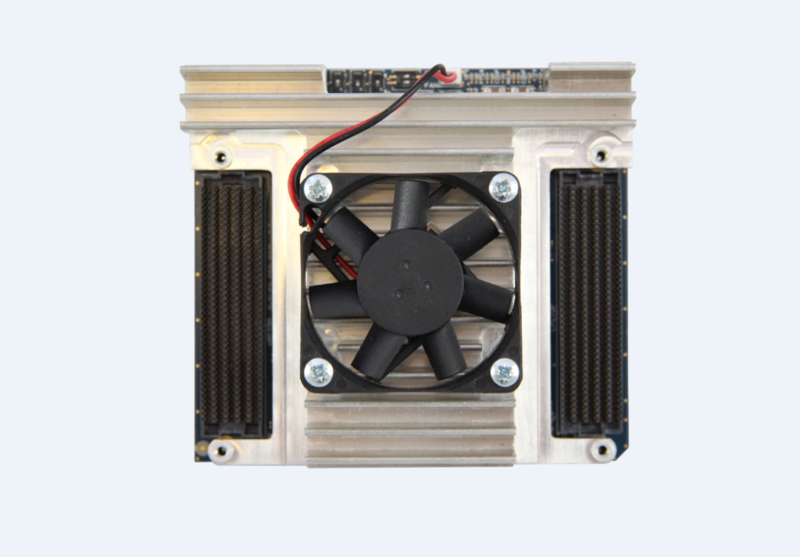 We also offer a PCIe Carrier Board as an optional extra, or can propose the design of a custom Carrier Board. 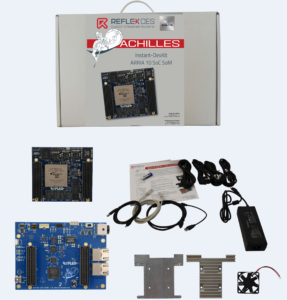 Achilles Instant-DevKit is comprised of the Arria® 10 SoC SoM plus a Starter board for quick prototyping and application testing. Check our General FAQ for more common information. 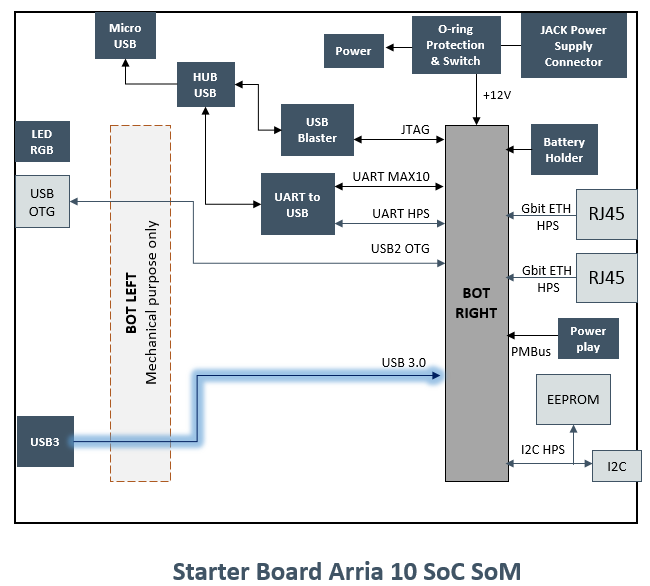 What is the Starter board for the Arria® 10 SoC SoM? How many versions of the Arria® 10 SoC SoM exists? 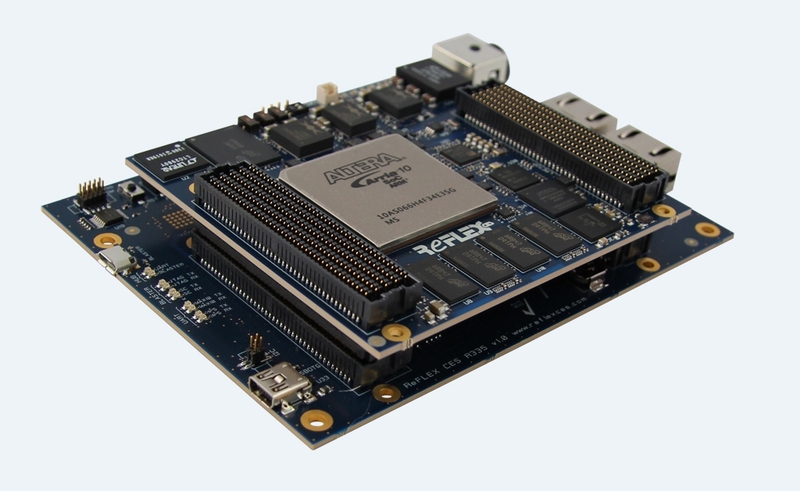 The Arria® 10 SoC SoM offers several versions that depends on the FPGA performances needs and the use of the board. Lite version: provides the industry’s lowest system cost and power, along with performance levels that makes the device family ideal for differentiating your high-volume applications. What is the PCIe carrier board and can I use the Arria® 10 SoC SoM on it? This document provides information for designing a custom Carrier Board for the Arria® 10 SoC SoM Module. It includes reference schematics for the external circuitry, required to implement the different interfaces available on the module. This design guide is intended for electronics engineers designing a carrier board for the Arria® 10 SoC SoM. In most cases, the examples come from designs that have been built and tested. The PHY component is connected to the Core Fabric of the Arria® 10 SX, the GPIF II interface is fixed at 8 bits on the PHY. This enables interface frequencies up to 100 MHz so a maximum work data rate of 800 Mb/s data rates after encoding, corresponding to High-Speed mode. How can I supply power to the Arria® 10 SoC SoM? With the Arria® 10 SoC SoM, the Max10 CPLD is used as an on-board system control which manage the voltage, temperature, power good, JTAG and communicate with the FPGA and the extremal world through UART and I²C link. Which ways of programming do I have on Arria® 10 SoC SoM? Scenario 1 : You can program the Arria® 10 FPGA and (or) the MAX 10 through USB blaster in JTAG mode. 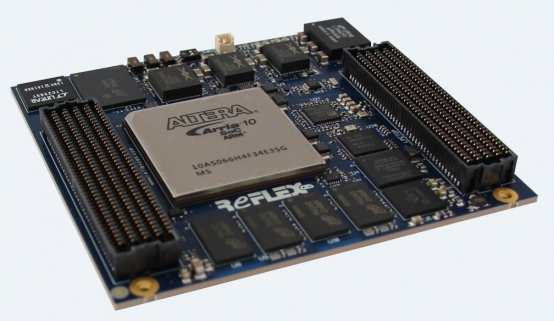 Scenario 2 : At power-up, Arria® 10 FPGA automatically loads via a quad serial interface with its dedicated FLASH EPCQ, in AS configuration mode. Intel ‘s Qsys system integration tool saves you time and effort in the FPGA design process, simplifying the development of complex hardware systems by automatically generating an FPGA-optimized network-on-chip interconnect, system Testbench, simulation model, software header file, and data sheet to expedite development across hardware and software teams. Qsys supports industry-standard interfaces, including ARM AMBA® AXITM, Avalon® Memory-Mapped, and Avalon Streaming interfaces. What is the size of the Arria® 10 SoC SoM? The figures into the Carrier design Guide documentation shows the Arria® 10 SoC SoM form factor with connector and attachement holes position, views from the TOP side of the board, dimensions in millimeters. Detailled STEP File of the Arria® 10 SoC SoM is available upon request, please contact support or your sale representative for more information.